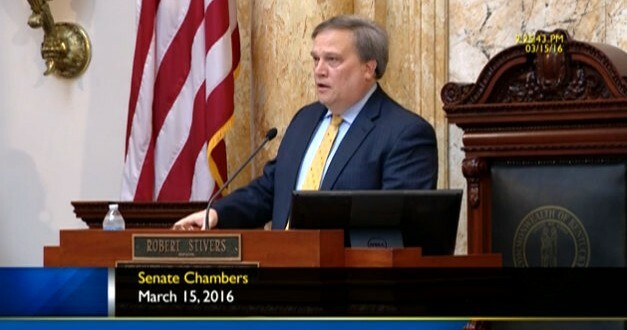 LIVE VIDEO: Kentucky Senate To Vote On Overturning All Local LGBT Rights Ordinances Statewide - Joe.My.God. Senate Bill 180, Senator Albert Robinson’s “License to Discriminate,” is set for a vote by the full Kentucky Senate this afternoon. SB180 narrowly cleared the Senate Veterans, Military Affairs, & Public Protection Committee two weeks ago, when the bill’s sponsor admitted his intent is to undo LGBT discrimination protections in eight Kentucky cities that have approved them. Those cities include Covington, Danville, Frankfort, Lexington, Louisville, Midway, Morehead, and the Appalachian town of Vicco. This “License to Discriminate” removes local control from these and other municipalities. Senator Whitney Westerfield has filed a floor amendment to SB180 which purports to narrow the overly broad religious exemptions carved out in SB180. In reality, the amendment does little to nothing to protect vulnerable Kentuckians from discrimination under this law. States that have passed similar legislation have experienced serious economic harm. A recent report from Visit Indy revealed a $60 million loss in tourism and convention dollars from Indiana’s similar law. Nearly 200 local employers in the Kentucky Competitive Workforce Coalition—including Brown-Forman Corporation, Humana, Fifth Third Bank, and more—are publicly backing statewide LGBT discrimination protections, which SB180 seeks to subvert. At this writing the Senate is dispensing with routine business. It’s not known when #SB180 will be called.